The complexity of the human brain depends upon the many thousands of individual types of nerve cells it contains. Even the much simpler mouse brain probably contains 10,000 or more different neuronal cell types. Brandeis scientists Yasu Shima, Sacha Nelson and colleagues report in the journal eLife on a new approach for genetically identifying and manipulating these cell types. Cells in the brain have different functions and therefore express different genes. Important instructions for which genes to express, in which cell types, lie not only in the genes themselves, but in small pieces of DNA called enhancers found in the large spaces between genes. The Brandeis group has found a way to highjack these instructions to express other artificial genes in particular cell types in the mouse brain. Some of these artificially expressed genes (also called transgenes) simply make the cells fluorescent so they can be seen under the microscope. Other transgenes are master regulators that can be used to turn on or off any other gene of interest. This will allow scientists to activate or deactivate the cells to see how they alter behavior, or to study the function of specific genes by altering them only in some cell types without altering them everywhere in the body. 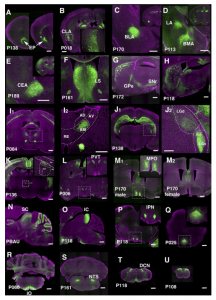 In addition to developing the approach, the Brandeis group created a resource of over 150 strains of mice in which different brain cell types can be studied. Shima Y, Sugino K, Hempel C, Shima M, Taneja P, Bullis JB, Mehta S, Lois C, Nelson SB. A mammalian enhancer trap resource for discovering and manipulating neuronal cell types. eLife. 2016;5. Seeing is believing, and fluorescently tagged proteins have ushered in a major revolution in cell biology. 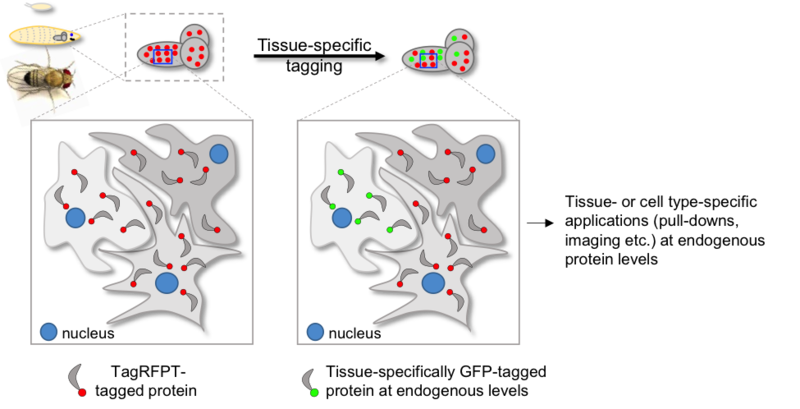 Instead of observing the static components of dead cells fixed in plastic and reacted with dyes, tagged proteins fluorescing a variety of colors can be tracked in real time in live cells and organisms. We can peek at the previously only imaginable perpetual dynamism of life at the molecular level. In addition to turning us into spell-bound voyeurs, well-defined fluorescent tags also give us a hand-hold to isolate the binding partners of proteins of interest. In a recent article by the Rodal lab reported in Biology Open, the authors report a new tagging methods designed to get rid of technological artifacts that can cause fluorescently tagged proteins to be expressed at the wrong time and place, and at the wrong levels. By using CRISPR mediated gene editing in fruit flies, they developed a novel approach to visualize any protein of choice in any tissue of choice at the level, localization and time that nature has intended. This method, dubbed T-STEP (for tissue-specific tagging of endogenous proteins), opens up novel experimental avenues to answer long-standing questions in several areas of neuroscience and cell biology, such as: how many different neurotransmitters are expressed in one neuronal circuit? Which tissue-type is a protein expressed in and when? What happens to a disease carrying mutant protein in a tissue of interest at endogenous levels? As a proof of principle, two endosomal proteins, Vps35 (linked to Parkinson’s disease) and OCRL (linked to Lowe syndrome), which have never before been seen or localized in fruit flies, have now been visualized live at endogenous levels. Moreover, a Parkinson’s disease-specific mutation (D620N) in Vps35 has also been tagged with fluorescent proteins, opening up exciting new research avenues for interrogating binding partners and/or kinetics that may be altered during the diseased states. In summary, T-STEP is an exciting novel tool that offers a simple and efficient method to tissue-specifically tag any protein at endogenous levels. Authors from the Rodal lab include Kate Koles (Research Scientist) and Anna Yeh ’16. Koles K, Yeh AR, Rodal AA. Tissue-specific tagging of endogenous loci in Drosophila melanogaster. Biol Open. 2015;5(1):83-9. Laboratories around the world and here at Brandeis are generating a tsunami of deep-sequencing data from organisms large and small, past and present. These sequencing data range from genomes to segments of chromatin to RNA transcripts. To explore this “big data” ocean, one can navigate the portals of the National Computational Biotechnology Institute’s (NCBI’s) two signature repositories, the Sequencing Read Archive (SRA) and the Gene Expression Omnibus (GEO). With the right bioinformatics tools, scientists can explore and discover freely-available data that can lead to new biological insights. Nelson Lau’s lab in the Department of Biology at Brandeis has recently completed two such successful voyages of genomics data mining, with studies published in the Open Access journals of Nucleic Acids Research (NAR) and the Public Library of Science Genetics (PLoSGen). Publication of both these two studies was supported by the Brandeis University LTS Open Access Fund for Scholarly Communications. In this scientific journey, the Lau lab made use of important collaborations from across the globe. The NAR study employed openly shared genomics data from the United Kingdom (Casey Bergman lab) and Germany (Björn Brembs lab). The PlosGen study employed contributions from Austria (Daniel Gerlach), Australia (Benjamin Kile’s lab), Nebraska (Mayumi Naramura’s lab), and next door neighors (Bonnie Berger’s lab at MIT). This collaborative effort has been noted at Björn Bremb’s blog, who has been a vocal advocate for Open Access and Open Data Sharing to improve the speed and accessibility of communicating scientific research. In the NAR study, postdoctoral fellow Reazur Rahman and the Lau team devised a program called TIDAL (Transposon Insertion and Depletion AnaLyzer) that scoured over 360 fly genome sequences publicly accessible in the SRA portal. Their study discovered that transposons (jumping genetic parasites) formed different genome patterns in every fly strain. Common fly strains with the same name but living in different laboratories turn out to have very different patterns of transposons. Simply noting “Canton-S” or “Oregon-R” strains are used may not be enough to fully characterize a strain. The Lau lab hopes to utilize the TIDAL tool to study how expanding transposon patterns might alter genomes in aging fly brains. In the PLoSGen study, visiting scientist Gung-wei Chirn and the Lau team developed a novel small RNA tracking program that discovered Piwi-interacting RNA loci expression patterns from many mammalian datasets extracted from the GEO portal. Coupling these datasets with other small RNA datasets created in the Lau lab at Brandeis, the Lau group discovered a remarkable diversity of these RNA loci for each species. For example, the piRNA genomic loci made in humans were quite distinct from other primates like the macaque monkey and the marmoset. However, a special set of these genomic loci have been conserved in their piRNA expression patterns, extending across humans, through primates, to rodents, and even to dogs, horses and pigs. These conserved piRNA expression patterns span nearly 100 million years of evolution, which is quite a long time for these types of loci to be maintained for some likely important function in mammals. To test this hypothesis that evolution preserved these piRNAs for their utility, the Lau lab analyzed two existing mouse mutations in these loci. They showed that the mutations indeed affected the generation of the piRNAs, and these mice were less fertile because sperm count was reduced. The future studies from the Lau lab will explore how infertility diseases may be linked to these specific piRNA loci. The Biology Department at Brandeis University invites applications for up to two full-time, tenure-track appointments, beginning Fall 2016, from individuals who are conducting innovative research in the broad areas of molecular and cellular biology. Junior and more senior investigators will be considered, but preference will be given to hiring at the Assistant Professor level. Areas of interest range across molecular genetics, genomics and cell biology, including topics such as RNA biology, cytoskeleton, intracellular transport, development, signal transduction, transcriptional and post-transcriptional regulation, membrane biology, and epigenetics. The research environment at Brandeis is highly collaborative, and we seek colleagues who will complement and extend existing strengths. Brandeis offers world-class research in the setting of a small liberal-arts university. Brandeis is located 7 miles from Boston, and is part of the vibrant research community of the greater Boston area. To apply, please provide the following: a cover letter, a curriculum vitae, a summary of your research accomplishments to date, including a statement of your goals for future independent research (3-page limit), up to three publications, and at least three letters of reference. Applications will be accepted only through AcademicJobsOnline at https://academicjobsonline.org/ajo/jobs/6064. First consideration will be given to applications received by October 15, 2015. Following an initial evaluation by the search committee, finalists will be invited to visit the campus to discuss their research and to meet with faculty and students/postdocs. Additional inquiries may be directed to Leslie Griffith or to Paul Garrity. Brandeis University is an equal opportunity employer, committed to supporting a culturally diverse intellectual community. Applications are particularly encouraged from applicants of groups underrepresented in the sciences. TIDAL-Fly: a new database resource of Transposon Landscapes for understanding animal genome dynamics. We tend to think of our genomes as nicely-ordered encyclopedias, curated with only useful information that makes up our genes. In actuality, nature and evolution is extremely sloppy. All animal genomes, from us humans to the simple fruit fly, are littered with genetic baggage. This baggage is sizeable, making up at least 11% of the fly genome and more than 45% of our genome. The scientific term for this baggage is transposable elements (TEs) or transposons, which are mobile entities that must copy themselves to other places of the genome to ensure their survival during animal evolution. Because there are so many copies of transposons, they can be difficult to analyze by most standard genetic methods. Brandeis postdoctoral fellow Reazur Rahman and a team in Nelson Lau’s lab have formulated a new tool called the Transposon Insertion and Depletion AnaLyzer (TIDAL). 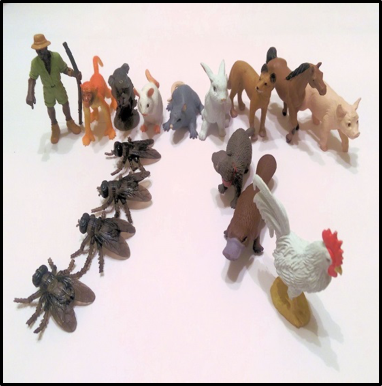 TIDAL aims to provide an accurate and user-friendly program to reveal how frequently transposons can move around in animal genomes. Currently, the TIDAL tool has been applied to over 360 fruit fly genomes that have been sequenced and deposited in the NIH NCBI Sequencing Read Archive. The outputs from this program are available to the whole genetics community through the TIDAL-FLY database. The TIDAL-Fly database will allow geneticists to pick their favorite fly strain and see if a transposon has landed near to their gene and perhaps affect gene expression. Fruit flies are key model organisms utilized by many researchers, including here at Brandeis, to study human diseases, from infertility to insulin signaling to aging to sleep disorders. Since these new transposon insertions are not available in the standard genome databases, this tool and website may provide answers to previously puzzling genetic effects not revealed by typical DNA sequencing studies. It is Reazur’s and the Lau lab’s goal to continue updating the TIDAL-Fly database with more genomes as fly genome re-sequencing becomes easier and easier to perform. see also: Rahman R, Chirn GW, Kanodia A, Sytnikova YA, Brembs B, Bergman CM, Lau NC. Unique transposon landscapes are pervasive across Drosophila melanogaster genomes. Nucleic Acids Res. 2015.